I’m writing this as I’m preparing for my fall exhibitions and thinking about my Artist Residency in Iceland December-January. Do we always just have the perception that the summer passes quickly or does it in reality? I’m like a kid that thinks I’ll have lazy down time in the summer months and then when the good part should begin—boom, zoom the summer is over. 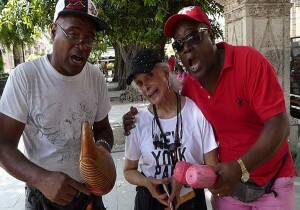 The hot weather for me started in May on a trip to Havana, Cuba for their 12th Art Biennial. The trip was a packed 8 days of art, artists and revelations! Colorful, chaotic, musical, multi-layered, with a background of romantic buildings in decay and new friends! 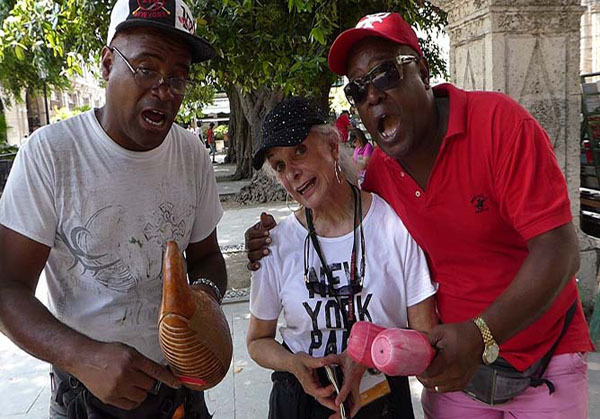 The biggest thrill was to find out that culture is an economic engine of Cuba. In June I worked on my Antarctic pieces inspired by my expedition last year. I’m excited that Mary Anne Redding will be curating this 4 month exhibit of “Antarctic Inspirations” with David Vogel and myself at the Turchin Center for the Visual Arts in Boone, NC spring 2016. I’ll keep you posted. 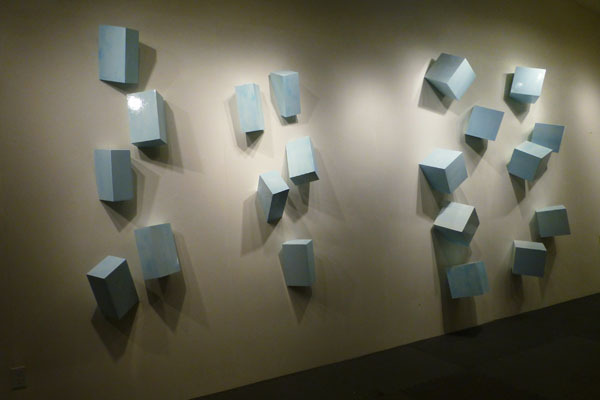 Art Aspen at the Aspen Ice Garden was jumping in August and my Denver gallery—Michael Warren Contemporary showed work from my blue paintings. September 11th begins my 6-week exhibition at Michael Warren Contemporary, Denver. I’m thrilled to be working with Mike McClung and Warren Campbell, both of whom are knowledgeable and appreciative of my art—an artist’s ultimate affirmation. I really look forward to this exhibit that was curated with their exceptional eyes. Hope you get to the Mile High to see this! I’ll be there at the opening September 11. In August I gratefully participated in a group exhibit of over 100 international artists at the Haegeumgang Theme Museum in South Korea. This extraordinary exhibition resonates the poetry of Taro Aizu bringing attention to Japan’s nuclear accident at Fukushima after the earthquake. The tragedy there is far from over—we can’t forget. In November I will have a solo exhibit at the esteemed Delaplaine Visual Art Center in Frederick, MD overlooking the historic Carroll Creek Park. “Water + Water” will display work on paper inspired by water! 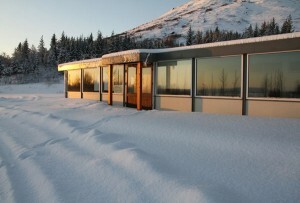 The opening is November 7 closing December 20. Besides the busy buzz of preparing and shipping work to these various exhibits I have just begun also to plan and schedule a commissioned triptych of BLUES—excited about that! And the editing and planning for a book of my poems written during an Artist Residency at the Morris Graves Foundation is in the works to be available on Amazon. I am so grateful to have the assistance in my work and studio of Joni Tobin Mayer and Julianne Aguilar. Their loyalty, sensibilities and skill sets are invaluable to me. In 2016 I’m planning (we know how that goes) to do tidying of house, studio and life as outlined by Marie Kondo in her immensely popular book, “The Life-Changing Magic of Tidying Up: The Japanese Art of Decluttering and Organizing”. This will hopefully include a studio sale of some of my inventory! 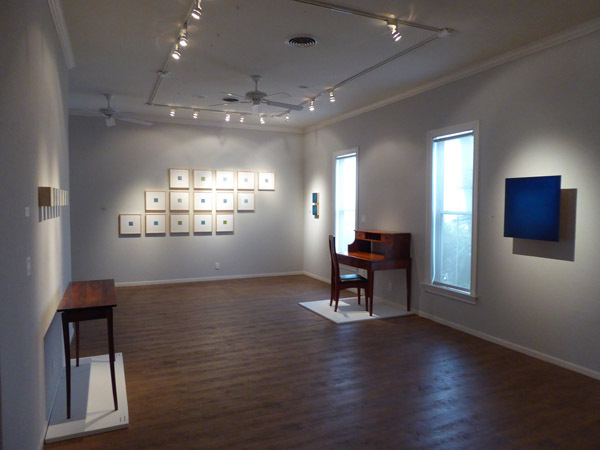 Last year John Aasp, the curator at the Rockport Center for the Arts in the Texas Gulf, contacted me about an exhibit idea he had. The Center hosts a Home Tour every spring and he wanted to integrate my art with the woodwork of George Bagnall and Michael Geer. As most of my paintings use fabricated birch frames John thought the art and woodwork would both stand-alone and yet show cohesively. John‘s vision and enthusiasm for the project excited me and I agreed to put the exhibit’s time slot on my calendar for 2015. We kept in touch as the year unfolded with contracts and ideas. At some point in our conversations John expressed a concept for my work that would express the environment of Rockport’s sea and sky. As my work reflects a sense of ‘place’ this seemed a perfect theme as sea and sky are definitely inspirations for my work. 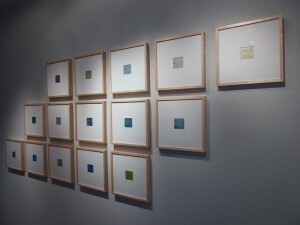 We soon chose an inventory of my work to be shipped and decided to use Sea and Sky for the title of my exhibit. I was very curious how John would install my art with the woodwork but had a great deal of faith in his vision as John is an accomplished artist (www.johnaasp.com) and had been curating exhibits at the Center for 8 years. As you well know time passes quickly, especially quickly it seems for timelines of crating and shipping work. I made plane and hotel reservations to be in Rockport for the exhibit’s April 11th opening reception and gallery talk and also the Home Tour. I arrived at the gallery the day before the opening and was so thrilled to see John’s vision unfold before me so exquisitely. 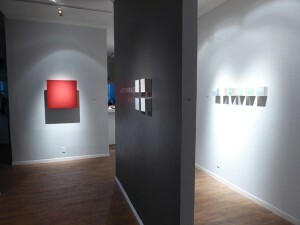 There were wonderful breathing spaces between the art works. 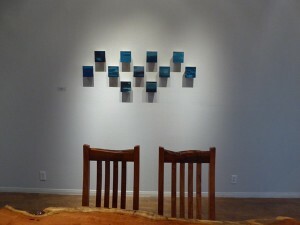 The wood furniture echoed my art with simplicity and elegance. In the entry space the furniture repeated its forms just as my work repeats color and shape—the repetitions resounding the intention. 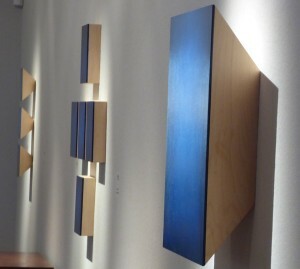 The intertwining of art and wood created a cadence of earthbound/sky-bound. 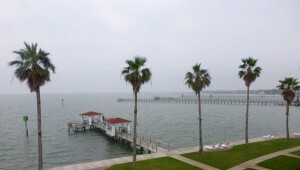 Our hotel room faced the Gulf bay with its broad vista. The weather was refreshing for dry-landers like me as clouds, rain and storms prevailed. It created a perfect backdrop for some of my paintings that are inspired by the sometimes chaotic weather systems of sea and sky. That evening we began to discover palate bliss with our choice of diverse restaurants. 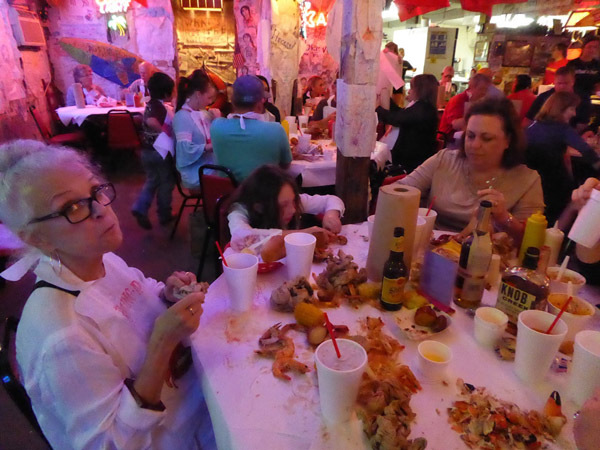 We luckily had guests and eating pals that traveled from Houston for the exhibit and we began eating through Rockport starting with yummy Italian cuisine and proceeded to exceptional seafood. The most entertaining meal was a fish boil that literally dumped our orders on our table with a mallet as our only eating tool. The opening reception was enthusiastic. The Rockport Center for the Arts knows how to throw a party. Their active arts community came out in droves and they were an attentive audience for the artist panel of Michael, George, our moderator John Aasp, and myself. It’s always a pleasure for me to talk about the intentions of my work. 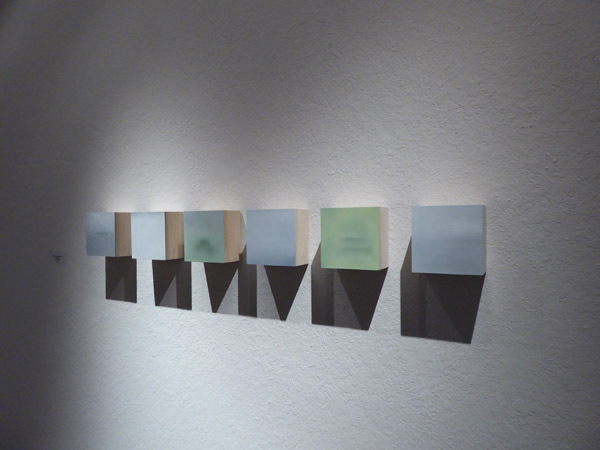 Reductive work like mine requires some backstory and deep looking for understanding. I enjoyed having the woodworkers talk about their approaches to their work and John asked probing questions. Afterwards refreshments magically appeared to add to the festivities and I had opportunities to speak one-on-one to the people in the audience. 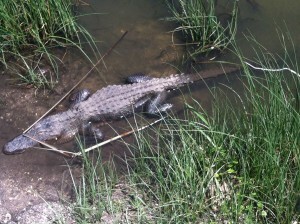 We then had a day to rest and another to venture out into the nature of the gulf. That was exhilarating. In just a few hours we saw migrating birds, crocodiles, wild turkeys, a cardinal, a pelican, deer and most exciting 2 bobcats! Wow. Nature and art are a great combination to complete a wonderful weekend. 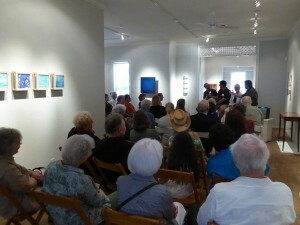 Art centers can be an exquisite way to provide art experiences in a community with exhibitions, classes, and in the case of Rockport Center for the Arts, a film festival, a home tour and an energetic, talented staff and volunteers providing exceptional experiences for audience and artists alike. I am grateful to have worked with this marvelous organization and look forward to working with Delaplaine Visual Arts Education Center, MD in November. PS: John Aasp left Rockport after the opening of Sea and Sky to become the Gallery Director for the College of Imaging Arts & Sciences at Rochester Institute of Technology, NY. I look forward to following his new ventures. For the past 22 years the Albuquerque Museum of Art and History has produced Miniatures & More, an invitational exhibit and sale of small paintings. This year I have been extended an invitation to exhibit my paintings and I am thrilled to be part of this time-honored tradition of my home town Museum. 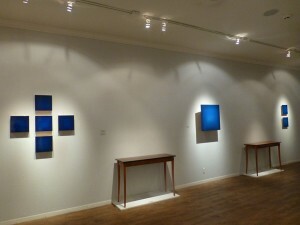 Three paintings from my oil on wood reductive Pixels series will be on display. 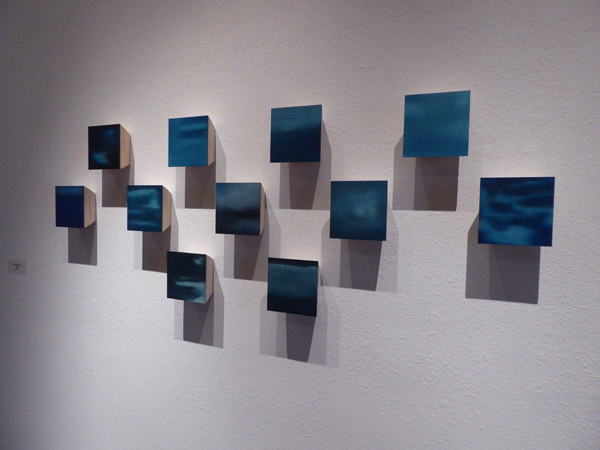 This work inspired by skies and seas from my travels will be shown for the first time locally. The quality of work in Miniatures is superb and represents terrific artists from the area. Many people look forward to attending and this year the exhibit opens with a Collector’s Dinner Saturday evening, October 25th followed by a Gala Saturday, October 26th. The exhibit will run until closing Sunday, December 8. I hope everyone has a chance to visit the Museum during Miniatures. Unfortunately, I will miss the October activities as I will be in Greece for an Artist Residency but I’ll catch up to the exhibit in November. I’m intrigued with the ‘dark matter’ in our universe. An astronomer whose lecture I attended stated that more answers, information and “stuff’ lies in the ‘dark matter’ than in what is lit and visible”. With my current black paintings I am trying to peer into that seemingly black void and be enlightened but do not have the extreme night vision required. There is something grand and ironic about the fact that where knowledge and illuminating facts might reside is mysterious and unavailable to us. 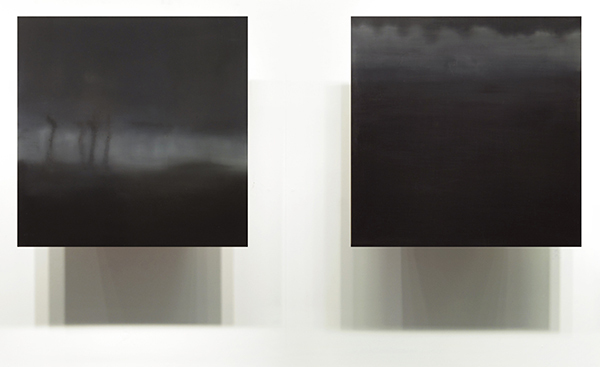 My black 24″ reductive oil on wood square paintings, that hover off the wall six inches, align with my Shades series aesthetically but they additionally pay tribute to mystery and the unknown. Do we really want to know everything? That seems like no fun to me. 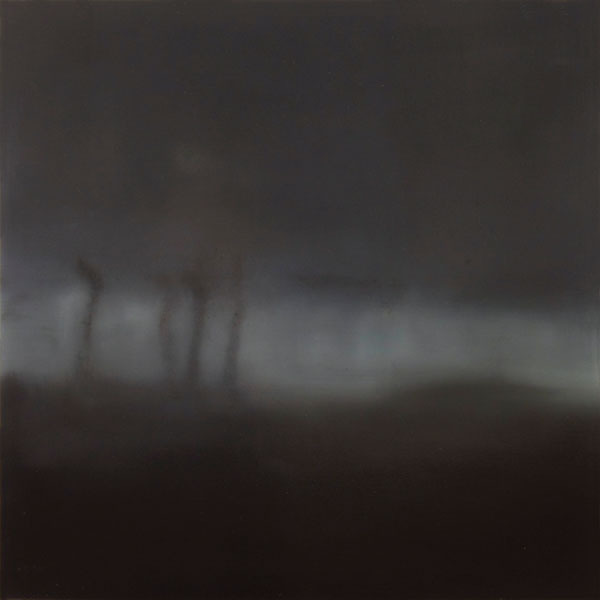 My reflections on ‘dark matter’ have luckily inspired paintings that are elegant, dramatic and a bit noir. There is a lot more to this color than meets the eye in science and in art. Enjoy. 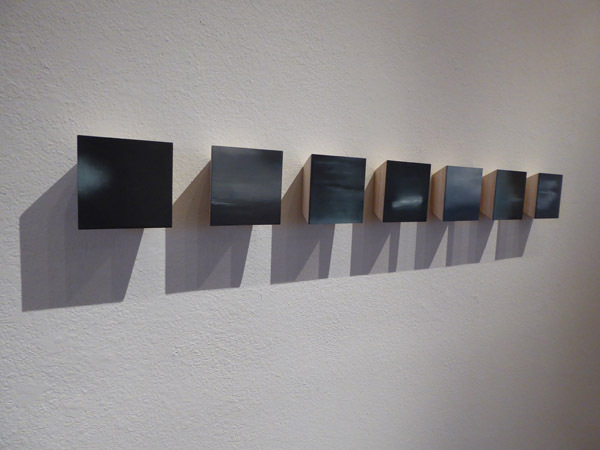 Insights 27 (left), an oil on wood painting from my reductive SHADES series will be showing in the wonderful group exhibit, Sea and Sky at the Liz Afif Gallery in Philadelphia from June 6-June 28. Other work including Lost and Found (right) from the SHADES series is now available at Snapp Price Projects Gallery in ABQ! Additional SHADES work can still be seen at Tinney Contemporary, Nashville and at Gallery Sonja Roesch, Houston. To view more work from this series please click here. SHADES was inspired by my silent, still and reverent observation of either the changing sea or sky around me. 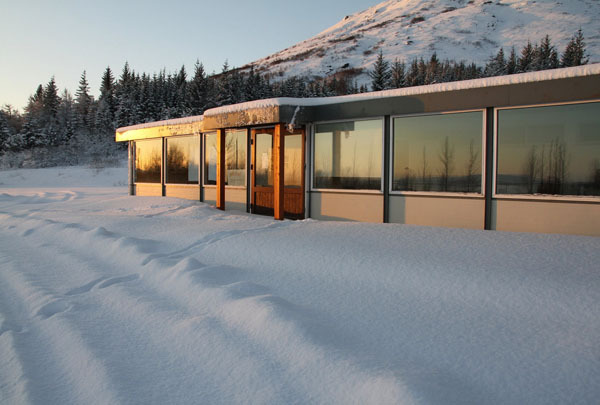 While in artist residencies by Italy’s Tyrrhenian Sea or in Finland’s Arctic Circle I resisted intelligence and was present in the natural world, learning about it up close, right here, right now. This softened the imaginary line between nature and me. 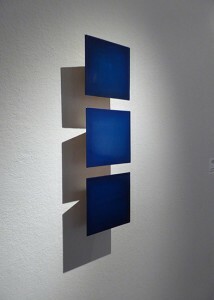 The resulting paintings also softened becoming reductive sensory memories capturing my feelings rather than the details. The sheer wonder of the world around me without the interfering static of everyday noise influenced my work helping me to sense the day’s moods and nuances that would have been missed in a usual day’s ‘attention blink’. Tapping into this undercurrent of knowledge is what my art is about. I use these elements to express my own visceral responses to life and to evoke those of the viewer. My life has taken a deliberate turn in the last decade—more focused—intrigued by empty space, interested in the air between the notes. Working in my home studio suits my need for the contemplative solitude my paintings require. Paradoxically I am also a traveler with much curiosity about the world. Exposure to unfamiliar places challenges my perceptions, expands my ideas and ultimately informs my life and my work. Finland’s weather of fog, mist, rain and cloud masses can all occur in a summer’s 24 hour lit day. 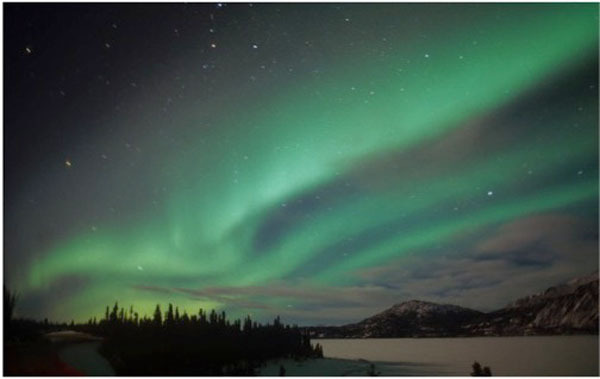 The northern sky’s light is infused with a translucent clearness that made me feel as though I could step into and through any barrier into the universe itself. Looking from my Finnish studio window I saw the sky’s wondrous shades of lemony yellow and pinks when the sun winked. Italy’s southern coast in contrast has vibrancy and high drama. The days were pregnant with every blue color value and the nights were black velvet. The sea’s beauty could be both tumultuous and soft as cashmere fascinating me from my studio or walking in the complimentary sands. I dipped my brush into my soul and painted what cannot be said verbally. I used the glazes in the paintings for the pure translucency of the skies, the gradations for the subtle nuances of color that shifted continuously and the bold contrasts and marks for nature’s spontaneous surprises. The sensuous spirit of my travels returned home with me in my work and in my heart.